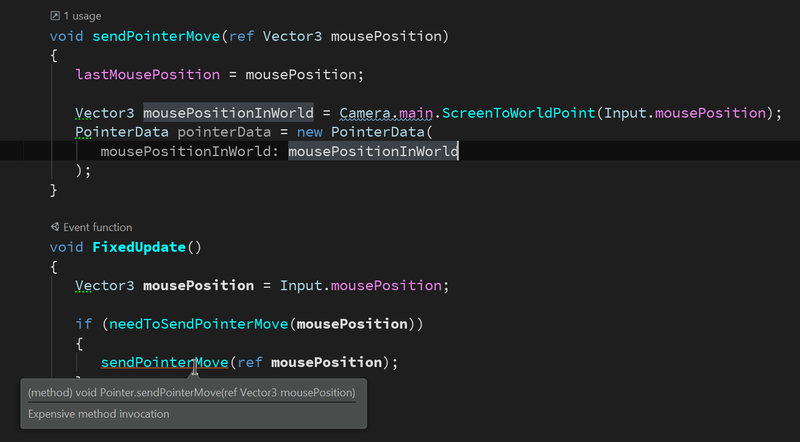 What are alternatives to Camera.main.ScreenToWorldPoint in Unity? I am sure that the issue is due to the Camera.main.ScreenToWorldPoint because when I comment out the part the warning disappears. Basically, when you call Camera.main, Unity internally uses the FindGameObjectsWithTag to search through all of the objects in your scene that have the 'MainCamera' tag, returning the first active one. Since this will always be slower than a direct reference to it, you should cache it. You can declare it as a member variable and then initialize it inside your Start function. Not the answer you're looking for? Browse other questions tagged unity camera coordinates or ask your own question. Alternatives to raycasts in unity?